The story of the Roosevelt administration’s response to the Holocaust has been chronicled in books and on film. Now, for the first time, it is coming to the stage. “The Accomplices,” an off-Broadway play written by former New York Times correspondent Bernard Weinraub and directed by Ian Morgan, will be performed by The New Group with preview performances starting March 20. After meeting with the author and cast for more than two hours last week, I have no doubt this is one play that will not be soon forgotten. Weinraub recently retired from the Times after a long and distinguished career as a staff correspondent. He is best remembered in the Jewish community for his explosive front-page exposes in 1983 about the ill-fated American Jewish Commission on the Holocaust. 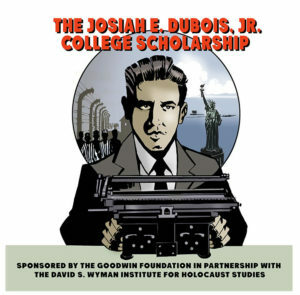 Chaired by former Associate Justice of the Supreme Court Arthur Goldberg, the commission brought together scholars and representatives of Jewish organizations, ostensibly to prepare an impartial review the American Jewish community’s response to news of the Holocaust. Instead, as Weinraub revealed, it fell apart, largely because some Jewish groups were not ready to acknowledge their predecessors’ failings. On one side of this drama stand President Franklin D. Roosevelt and the antisemitic Breckinridge Long, whom FDR put in charge of immigration affairs. The play shows how, with FDR’s approval, Long did everything possible to obstruct opportunities for rescue, and to keep the number of Jewish immigrants way below even what the restrictive immigration quotas allowed. On the other side stands the American Jewish community–anguished over the suffering of Europe’s Jews but deeply divided as to how to respond. These divisions are exemplified through Rabbi Stephen Wise, the most prominent Jewish leader of the time, and Hillel Kook –better known as Peter Bergson– a maverick activist who led controversial protests against Roosevelt’s refugee policies. Wise favored a cautious, low-key response to the news from Europe; Bergson led marches in Washington and sponsored full-page newspaper advertisements that rocked the Jewish community, Capitol Hill, and beyond. Infusing the characters’ dialogue with their actual language, taken directly from historical documents, Weinraub succeeds in bringing these painful events to life. Precisely because Weinraub strives to maintain historical accuracy, the story does not reflect well on FDR. That’s obvious from the play’s title. But then, one sometimes forgets that even at the time, Roosevelt was strongly criticized –including by some of his most loyal supporters– for his refusal to rescue Jewish refugees. During the first week of rehearsals, I was invited to brief the cast of “The Accomplices” about the historical issues and personalities they are portraying. As it turned out, they needed much less briefing than I would have expected. In recent weeks, they have been reading David Wyman’s 1984 best-seller The Abandonment of the Jews, Stephen Wise’s autobiography, transcripts of interviews with Peter Bergson, and the diaries of Breckinridge Long. By the time the play opens, they are likely to be one of the best-informed casts of any historical drama in recent memory. I was not surprised to learn that an early version of “The Accomplices” won last year’s Plays in Progress Award. And I will not be surprised if this spring’s production wins a few awards of its own. But awards aside, it will no doubt serve its main, and very important purpose–to educate the public about a difficult chapter in our nation’s history. Previous Post:Was Churchill Antisemitic–and Does it Matter?